Over the next eight to nine years, energy storage capacity in developing countries is expected to skyrocket from 2 gigawatts (GW) today to more than 80GW, according to a new report by the World Bank Group. 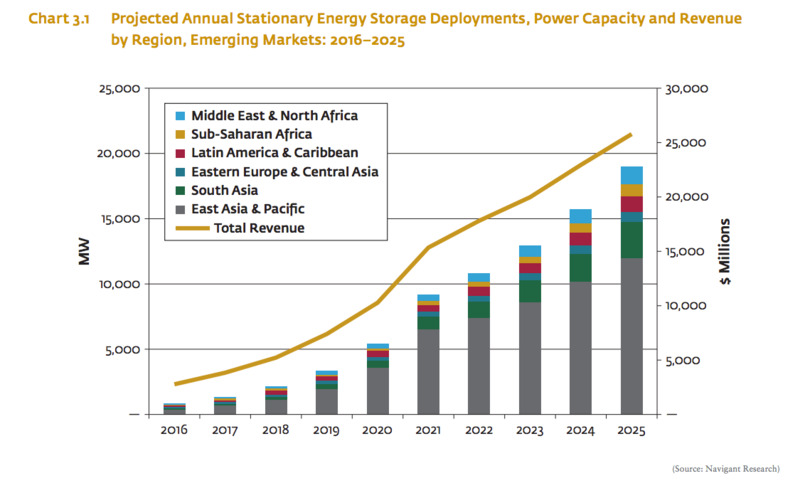 The report, “Energy Storage Trends and Opportunities in Emerging Markets,” indicates the annual growth in energy storage capacity will exceed 40% each year over the next decade. The study, commissioned by the International Finance Corporation (IFC) and the World Bank-administered Energy Sector Management Assistance Program (ESMAP), indicated the largest energy storage markets are expected to be China and India. The researchers believe that 78GW of new solar and wind generating capacity was installed globally in 2016, and that 378.1GW is projected to be installed over the next five years. While the cost for deploying renewable energy systems continues to fall, integrating technologies such as photovoltaic rooftop systems and solar farms into regional grids will require energy storage in the form of batteries and other technologies for load continuity. Those storage technologies include mechanical systems such as flywheels, compressed air or pumped hydro; electrochemical storage, such as lithium-ion (li-on) and flow battery technology; and thermal systems like phase-change technology. Phase-change tech uses materials such as molten salt to store heat from concentrated solar farms for later release in steam generators. Tesla CEO Elon Musk announced earlier this month his company is now mass producing li-ion batteries for both commercial and residential use. His first “gigafactory” outside Reno, Nev. has a footprint of 1.9 million square feet of manufacturing space. Musk already plans to build other gigafactories around the world. The Tesla Gigafactory outside Reno, Nev. The goal, Musk said, is to eliminate the world’s dependency on fossil fuels for power. To do that would require two billion of Tesla’s new commercial-grade battery systems, he said. While li-ion batteries currently dominate the market, a diverse blend of battery technologies is beginning to be deployed. Flow batteries and li-ion batteries work well with intermittent energy sources such as solar panels and wind turbines because of their ability to be idle for long periods without losing a charge. Flow batteries, however, scale more easily because all that’s needed to grow capacity is more liquid; the hardware remains the same, according to Dean Frankel, an associate at Lux Research. That means flow batteries have the potential to be less expensive than li-ion for large-scale storage. They also last longer, according to Frankel. At full discharge, li-ion batteries last only four hours. To double that length of charge, another complete battery unit must be added. Lux Research’s figures for between now and 2024 envision a precipitous drop in flow battery system costs. The cost is currently $755/kWh for a 4-hour battery, according to Lux. That is expected to fall to $516/kWh by 2024. For large scale Li-ion systems, costs will fall from $626/kWh this year to $498/kWh in 2025, according to Lux Research. 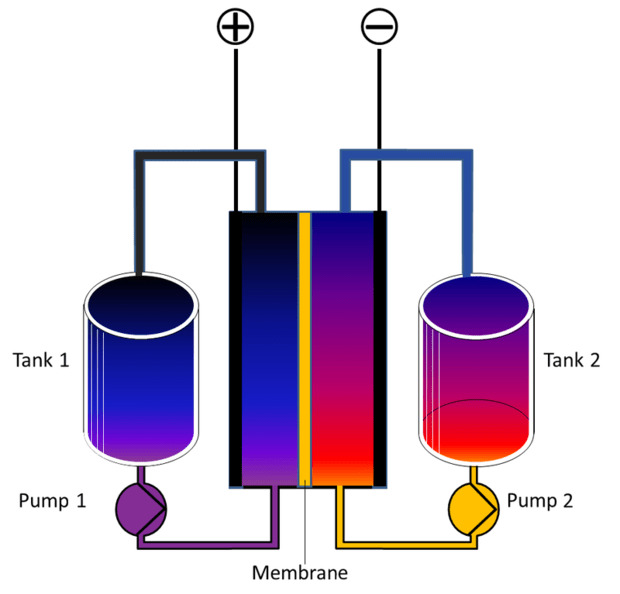 The basic concept behind how a flow battery works. Flow batteries get their name because they use liquid chemicals (electrolytes) that are separated by a membrane. The reaction between the two chemicals frees up electrons, creating electricity. Currently, about 1.2 billion people in emerging economies lack access to electrical power. Traditional centralized grids are not cost effective at providing even basic electrical service to underserved populations in a reasonable amount of time, the World Bank Group’s report claimed. An already aging grid infrastructure in many developing nations is also driving the adoption of distributed grid technology and energy storage systems. By 2030, it is estimated that $45 billion will need to be invested to provide universal access to modern electric power — and energy storage is set to play a key role in those investments. Energy storage will not only enable better use of both new and existing resources but also protect against threats, such as natural disasters, according to the United Nations Sustainable Energy for All initiative. In the Asia-Pacific region, where a large portion of underserved people live, there are two main types of power grids, each with different characteristics and opportunities for energy storage. In highly developed countries, such as Japan, South Korea, New Zealand, and Australia, advanced power grids are expected to dominate and will be characterized by high reliably and advanced technologies. In developing nations, where there is limited or unreliable power grid technology, distributed storage systems and microgrids are expected to dominate, the World Bank Group’s report said. Microgrids, which can serve the power needs of small towns or cities as well as commercial and industrial complexes, can also connect or disconnect from primary power grids.